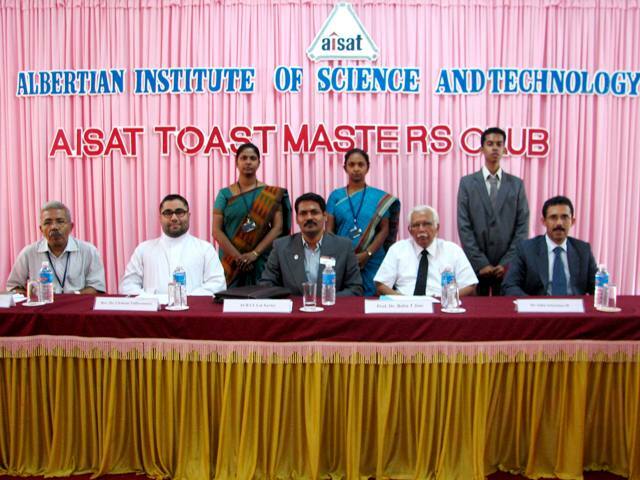 The AISAT TOASTMASTERS CLUB was inaugurated on 4th April 2014. The program started with a welcome speech by Prof. Dr. Babu .T. Jose, the Director of AISAT, ACB CL Lal Xavier, the Division Governor of Kerala Toastmaster’s International inaugurated the event by lighting the traditional lamp. In the inaugural address, he stressed the importance of public speaking skills and the benefits of joining toastmasters club. The inaugural session was followed by the official chartering ceremony of the new club. The Division Governor, ACB CL Lal Xavier, did the installation ceremony of the new club officers and administered the oath of office to the new officers. Rev. Dr. Clement Valluvassery, the newly chartered President of AISAT Toastmasters club delivered the acceptance speech. Prof. K.E George , the Principal AISAT and Dr. Sabu Sebastin offered felicitations. This was followed by a mini educational program where the Toastmaster ACB Jaikumar C Pillai, Asst. Division Governor Ed & Trg. introduced the role players to the audience. The project speaker Ms.Tina Suzanne George spoke on Project No.4, basic manual which was evaluated by Competent Communicator Mr. C.Jayaraman. Then there was a joke session with toastmaster C S Ninan as the Joke master. The other interesting event was the Table Topics conducted by ACS Prof.George Mathai where the topic speakers spoke for 2 minutes each instantly without any preparation on the topics given by the table topic master. Ms. Minnu Shaji, AISAT Purple league member delivered the vote of thanks. The President, Rev. Dr. Clement Valluvassery concluded the formal part of the evening with his closing remarks.